Recently released, Obliterated Families is an interactive documentary that draws attention to the families from Gaza whose lives were shattered during the Israeli offensive in 2014. 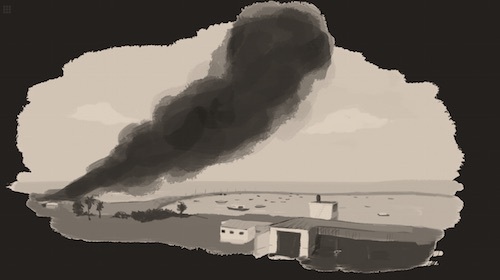 Blending together striking images, in-depth text, infographics, animations and short videos, the project is designed to bring the audience closer to the reality of life for Palestinians from the Gaza Strip. I spoke with the authors of the work – Anne Paq, member of the Activestills photocollective and Ala Qandil – who have collaborated with dozens of other media professionals over the last two years to make the project a reality. As well as taking a deep dive into the work itself, our interview explored their reasons for making Obliterated Families, the considerations for both audience and subject, and the challenges of independently producing such a complex project. For the project, Paq met and interviewed over 50 families from different parts of the Gaza Strip, with ten stories told in-depth included in the final work; “We had met a few of those families long before we knew that we will end up producing a multimedia web doc. A lot of writing is based on the memories of those meetings from before or during the Israeli offensive. Anne has recorded dozens of interviews with survivors, detailing attacks and the life in the aftermath. But once we decided to focus on the ten families, and Ala went back to Gaza to meet with some of them again and work on their portraits, we had to make a choice. Numbers have often been used to describe the Israeli offensive on Gaza: 51 (days), 2,200 (dead Palestinians), 500 (children killed), 11,000 (injured), 100,000 (homeless), 0.5 million (displaced). But the statistics do not reflect the loss of a loved one, the bombing of a family home, the conditions in an overcrowded UN school, the fear or the trauma that comes after the ceasefire. Obliterated Families takes those figures and makes them human, giving an intimate tale of sudden loss, pain, and life in the aftermath. However it wasn’t just practical considerations that caused them to release the work in chapters. The pair thought about the audiences’ capacity to digest and reflect on these difficult stories: “Despite our best attempts to make it easier on the audience, they are difficult to watch and read, because each one of them breaks your heart, disturbs you, and we hope – doesn’t allow you to stay indifferent. “You read the family history, childhood memories, you start to identify with the people – imperfect, very human, and than they share with you the story of the attack that took away their family, the moments of fear, the pain of loss. It’s not only that the viewers will not be able to take in more than a chapter at a time. We actually hope that people who visit the website will take their time, read one of the stories and come back ones they had enough time to process it. Anne continued, “So many people in the ‘west’ see what happened in Gaza with such distance, as if our governments do not have a responsibility in it, whereas it is clear that if Israel can continue its oppressive policies of occupation, colonisation and military offensive, it is because of the complicity of our governments, and the total impunity Israel enjoys for its crimes. “So I do hope that this project will bring the audience closer to Gaza, and closer to a better understanding about what people have been through. I do hope that people will question not only Israeli actions but also their governments’ stances. I really hope that the people will use the tools we will provide, such as the exhibitions kits to engage with their communities. The impact of the work is already being felt, “We had met some of the families whose stories we tell before or during the war. One of them was the Shuheibar family. Anne Paq documented the funeral of the three children Afnan, Basel and Jihad, killed on the roof of their home while feeding the pigeons. 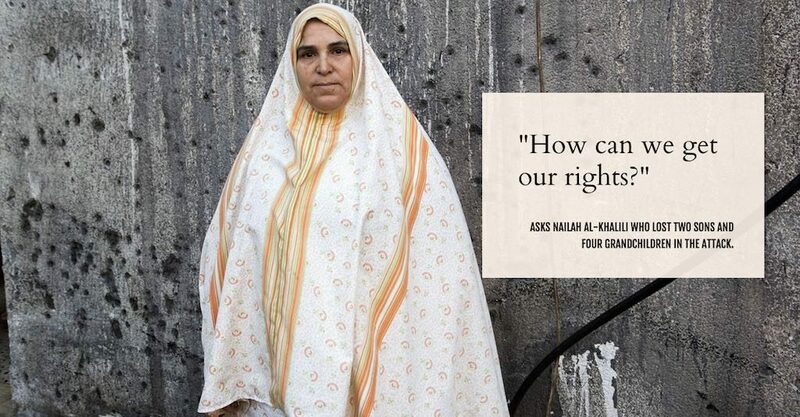 A few months after the ceasefire, Paq returned to Gaza and met the family again. When Wissam, father of Afnan, learnt she was French, he insisted on showing her a fragment of the bomb that killed his daughter. Based on the inscriptions on the fragment, Wissam suspected it was produced in France. Anne reported it to a local human rights organization. Military experts hired by a French human rights NGO confirmed that the piece was produced by a French company Eurofarad, later acquired by Exxelia Group. Preceding the release of the web documentary the pair also published a short film: “Gaza: A Gaping Wound” which can also be found on the Obliterated Families site. The stories were released over the last two months, each on the anniversary of the attack on the family whose story the chapter tells. You can watch them all here: www.obliteratedfamilies.com.